The Avalon Newport is a neat, compact pellet stove with a large bay viewing window for its size. Capable of heating 1,600 square feet and producing 28,000 btu. 's, it has an exceptionally large hopper for such a small stove which provides a burn time of fifty hours. See comments below. The hopper holds fifty five pounds of pellets, and the top of the stove opens completely for easy access. Optional extras are a wall mounted thermostat which can shut the stove down and restart it as needed. A remote control is also optional. Max. Heat Output 28,000 btu. Hopper Capacity Freestanding 55 lbs. Insert 35 lbs. Burn time Freestanding 50 hrs. Insert 30 hrs. Convection Blower Capacity 130 cfm. Window Size 18 in. by 9 in. Rear Vent Height Freestanding 16.9 in. Insert 9.4 in. Small: 40.5 in. by 29 in. Large: 44.5 in. by 32 in. 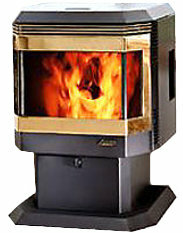 The insert hopper capacity is smaller than the freestanding stove, giving the insert a maximum burn time of thirty hours. The Avalon Newport has a 'maintenance required' diagnostic system on the control board. Clean the heat exchanger tubes, vacuum the hopper, clean gold trim surfaces. If you would like to leave a review of the Avalon Newport pellet stove or fireplace insert, please use the form on the contact page.